Hello evaluation world! We are Kat Athanasiades and Veena Pankaj from Innovation Network. Fig. 1: A typical expression of one of the authors in this situation. 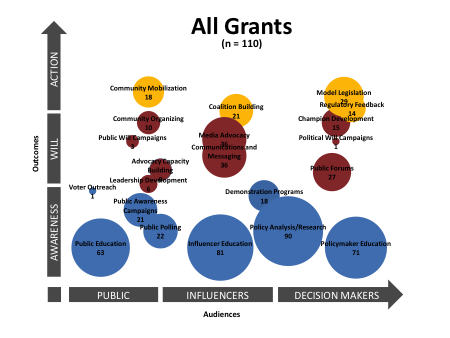 We were recently tasked with guiding evaluation for a funder’s national advocacy campaign, and had to make sense of advocacy data contained in 110 grants. Where did we start? 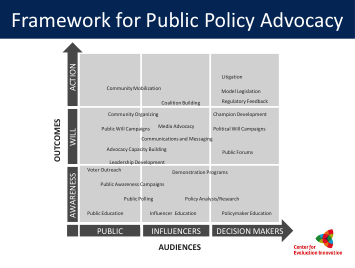 Julia Coffman’s Framework for Public Policy Advocacy (the Framework; Fig. 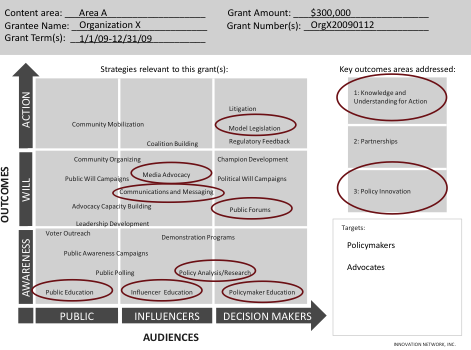 2), a comprehensive “map” of strategies that might be used in an advocacy campaign, was the perfect tool to analyze the grant reports. It let us identify and compare advocacy strategies employed by grantees individually, as well as step back and look at strategies used across the campaign. Rad Resource: You can learn more about the Framework in Julia Coffman’s Foundations and Public Policy Grantmaking. Fig. 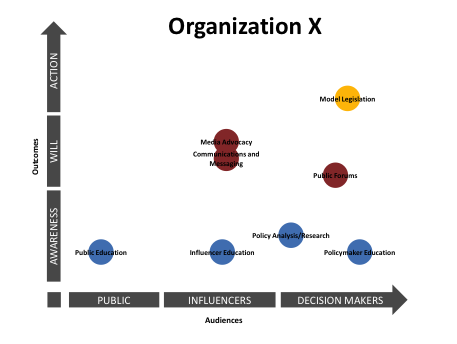 2: The Framework for Public Policy Advocacy plots advocacy strategies against possible audiences (X-axis) and different levels of engagement of those audiences (Y-axis). So how did we actually use the Framework to help us with analysis? 1. 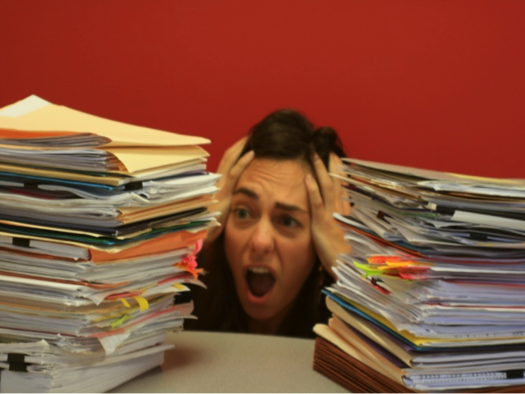 We reviewed grant reports and determined which strategies were used by each grantee. We created a top sheet to record this information (Fig. 3). Fig. 3: A sample top sheet for one grant, with relevant advocacy strategies identified.We entered the data into Excel, where it would be easy to manipulate into a visual, reportable format. 2. We entered the data into Excel, where it would be easy to manipulate into a visual, reportable format. 3. We created a series of “bubble charts” (a chart option in Excel) to display the information (Figs. 4, 5). Fig. 4: Each “bubble” above represents an advocacy strategy used by Organization X. Blue bubbles represent awareness-building strategies, red show will-building, and yellow denote action strategies. Fig. 5: Across all the grants in this campaign, you can quickly see by the bubble size that certain strategies were prioritized: specifically, grantees used awareness-building strategies most often. These charts allowed the funder to quickly grasp the breadth and depth of the advocacy work in their campaign. Hot Tip: If you’re designing data collection, the Framework provides a systematic way to sort grantees for further analysis based on the type of advocacy work they are engaged in. Rad Resource: Want to learn how to make bubble charts? Check out Ann Emery’s blog to get help on constructing circle charts. We would love to hear how you use the Framework in your work! Let us know via email or in the comments below. Thanks for share This ,Help me A lot !!! !